Agrotechnomarket.com - For 53 years or since 1966, the National Farm Machinery Show and Tractor Pull is one of the largest agriculture trade show and conference that has offered the most complete selection of the latest agricultural technology, and innovation, equipment and services available in the agriculture industry. In 2019, the show will be held on February 13 – 16 at Kentucky Exposition Center, 937 Phillips Lane, Louisville, KY 40209. Agricultural professionals from around the world gain knowledge and hands-on access to agricultural products and various technological advancements needed for farmers across the country. The Kentucky Exposition Center is completely filled with over 800 exhibitors beginning computer software and electronics for agricultural innovations, agricultural constructions, sheds and fencing, irrigation equipment, livestock management software, pest control solutions, agrochemicals and fertilizers, organic farming, mowing and harvesting equipment, food processing equipment, livestock breeding and supplies, tillage implements and much more. Nearly every farming equipment will be on display allowing visitors to compare products side by side. The most innovative technology and new agricultural product launches are available to agribusiness experts, as well as alternative energy information and solutions to the challenges facing today’s agribusiness industry. In addition to seeing the newest products on the market, guests can attend free educational seminars led by industry experts in the world of farming. Seminar topics include unmanned aerial vehicles (UAVs) or drones for agriculture, cloud-based data handling, and weather and commodity trends. Guests will also be able to watch Tyne Morgan and Al Pell during a live-taping of "U.S. Farm Report." 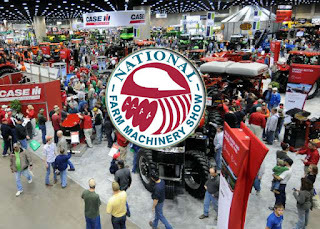 1 Response to "National Farm Machinery Show and Tractor Pull 2019"